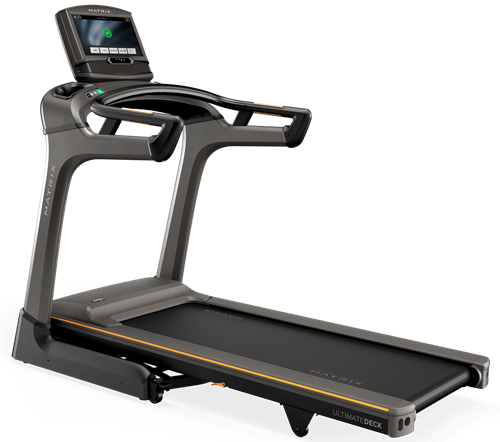 A dynamic folding design makes it a snap to lift the treadmill deck to a near 90-degree angle and roll the unit away on a four-wheel transport system when you need the space, then unlock the deck and lower it smoothly when it’s time for a heart-pumping workout. Matrix's Johnson Drive™ System helps you stay in perfect rhythm with a quiet, durable, responsive 3.25 HP continuous-duty drive system that recalibrates with each footfall. The 51 x 140cm / 20" x 55" running surface provides the most room to move on Matrix's exclusive Ultimate Deck™ System that includes a heavy-duty frame, extra-thick deck and industrial-grade cushions for miles of durable performance. Our welded steel frame provides excellent stability for users and workouts of all kinds, offering the most true-to-life running experience on the home fitness market. It also features up to 15° of incline. 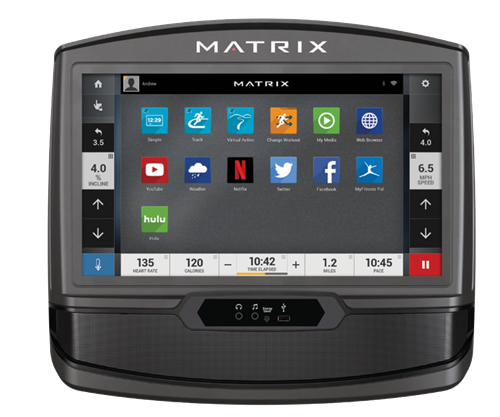 Our Ultimate treadmill console features a 16" Class HD touchscreen with Simple, Track, Virtual Active, Change Workout, Weather, My Media, Web Browser aps (other apps vary by market) as well as eleven preset programs to help get you started on your workouts right away. The TF30-XIR is also compatible with the Passport™ media player, which is sold separately.